Rainless weather awaits Bakuvians on February 24, the Ministry of Ecology and Natural Resources reported. Mild south-west wind will be replaced with north-west wind in the afternoon. 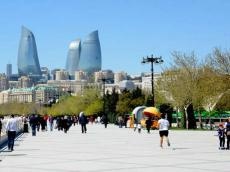 The temperature will be +2-5?C at night, +8-13?C in daytime, +15?C in some places, in Absheron peninsula, +2-4?C at night, +11-13?C in the daytime in Baku. Air pressure records 767. Relative humidity will be 85-95% at night, 60-70% in the afternoon. In the regions of Azerbaijan, the weather will be mainly dry in Azerbaijani regions. It will be foggy in some places at night and in the morning. West wind will blow and intensify in some places. The temperature will be 0-5?C at night, +13-18?C in daytime, 0-5?C in mountains at night,+5-10?C in daytime. Fluctuation of atmospheric pressure in Absheron peninsula, occasional intensification of gilavar and khazri wind from February 23 to 26 daytime will be unfavorable.